John Cornyn: We've had 17 federal shutdowns since 1976; Obama is AWOL. Mitch McConnell: Federal shutdown was just a 2-week paid vacation: bad policy. Mitch McConnell: ObamaCare is a train wreck; do what we can to repeal it. John Cornyn: End Congress' carve-out exemption from ObamaCare penalties. Jeff Sessions: Opposes amnesty first; finish fencing and enforcement first. Jack Reed: Coalition to stop Syrian WMDs, but nothing more militarily. 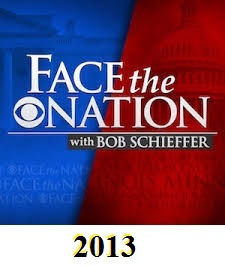 (Bob Schieffer interviewing candidates for 2014 and 2016 races).